Press conference on Qadri �s long march. 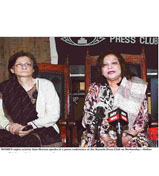 In order to express civil society�s concern on the Tahir-ul-Qadri�s Long March, Aurat Foundation organized a press conference on January 15, 2013, at the Karachi Press Club. Meeting with Pakistan People�s Party on manifesto suggestions for women�s empowerment. 3rd meeting with Pakistan Tehreek Insaf manifesto suggestions. Aurat Foundation organized an advocacy meeting on Suggestions on Women�s Empowerment for Election Manifestos of Political Parties with Mr S.M. 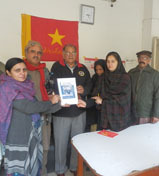 Zafar, Chairperson of manifesto committee of Pakistan Muslim League (Q) on 12Jan 2013 at his office, Lahore. Meeting with Pakistan Tehreek Insaf on manifesto suggestions for women�s empowerment. 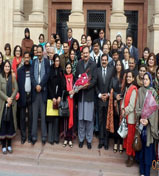 Aurat Foundation organized an advocacy meeting on Suggestions on Women�s Empowerment for Election Manifestos of Political Parties with central leadership of Pakistan Tehreek Insaf on 10 Jan 2013 at PTI, Punjab Office. 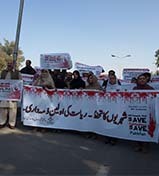 Members of civil society organizations staged a rally to show solidarity with slain aid workers and polio vaccinators. 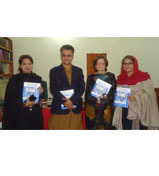 Aurat Foundation organized an advocacy meeting on Suggestions on Women�s Empowerment for Election Manifestos of Political Parties with members of Manifesto Committee of PTI on 9 Jan 2013 at AF office, Lahore. Head Office of Awami Workers Party, Lahore. Meeting with Awami Workers Party. Reference & vigil for the slain aid workers. 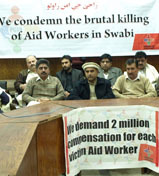 Aurat Foundation and the Pakhtunkhwa Civil Society Network (PCSN) arranged a meeting to pay homage to the slain workers aid workers including six women in swabi. Meeting with leaders of Sindh Taraqi Pasand Party and Awami Tehreek for manifesto suggestions. 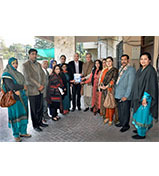 Aurat Foundation launched 'Pakistan NGO Alternative Report on CEDAW-2012' on December 18, 2012, at Pearl Continental Hotel, Karachi. 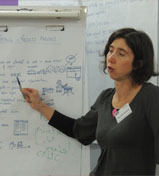 Launching NGO Alternative Report on CEDAW � 2012, and National Women�s Assembly. 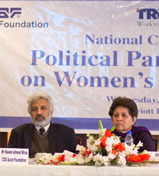 Ms Anis Haroon, Member, Board of Governors, Aurat Foundation, presided over the ceremony. Launching �One Billion Rising� campaign to end violence against women. 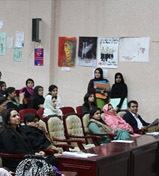 The ceremony was organized at the auditorium of Department of Earth Sciences, Quaid-e-Azam University.